When buying diamond rings at JewerlyRoom.com, you can expect to find the same high-quality rings you would find in a jewelry store for a fraction of the price. That’s because JewelryRoom.com acquires our diamond rings at rock bottom prices from liquidations, bankruptcies, and overstock sales, and we are happy to pass these savings on to you. 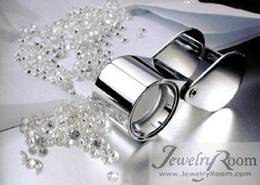 JeweryRoom.com was started by a reputable jewelry manufacturer that had been a trusted name in the industry since 1955. In 1999, this manufacturer decided to expand to internet jewelry auctions in order to better serve jewelry customers like you. The online auction side of the business started off on eBay, where we earned the rank of Titanium Power Seller. Since 1999, we have completed over 1 million online transactions, and we’ve learned how to bring our customers the wide variety of diamond rings that they demand at an affordable price level. Bottom line—you can trust JewelryRoom.com! Our auctions are safe and fair, and we pride ourselves on being a reliable, established presence in the online diamond auction niche. All of our rings are backed by our 100 percent satisfaction guarantee: if the ring is not as advertised, you can exchange it within 15 days. Before you begin shopping for diamond rings on JewelryRoom.com, take some time to familiarize yourself with the “4 C’s” of diamonds: color, clarity, carat weight, and cut. At JewelryRoom.com, every diamond listed on our site contains a full description, including how it scores on these 4 C’s. Understanding the 4 C’s will help you to know the value of a given diamond and enable you to compare our prices to retailers and other auction sites. Diamonds are rated for color on a scale that ranges from D to Z, with D being colorless and Z being strong yellow. The closer a diamond is to being colorless, the more valuable it is. Yellow diamonds are gaining popularity for accent rings, but in general, when choosing a diamond ring (especially an engagement ring) you want a diamond that is as bright and colorless as possible. Diamonds rated D, E, or F (colorless) or G, H, I, or J (near colorless) are ideal. Diamonds are also rated for clarity on a scale that ranges from Flawless (F) to Included (I). Fortunately, it isn’t necessary to pay for Flawless clarity in order to get a spectacular looking diamond. The slight inclusions (cloudy blemishes or dark spots) inside a diamond can often be concealed from the naked eye through clever cutting and setting. When shopping for a diamond ring on JewerlyRoom.com, look for diamonds rated Very Slightly Included (VSI1 or VSI2) or Slightly Included (SI1 or SI2). These diamonds will offer the best price points, and their inclusions will often be invisible to the naked eye. Avoid diamonds ranked Included (I1, I2, or I3), as these stones will be visibly cloudy, spotted, or dark. Diamonds are measured by weight, not size. The carat weight tells you how big your diamond is, but not how big the surface area of the stone will be. However, learning to visualize the common sizes of different carat weight stones can still help you to get an idea of what your diamond ring will look like in person. Note that descriptions of diamond rings with multiple stones sometimes provide a combined or total carat weight. This helps you estimate the total worth of all the stones. The cut of a diamond is what gives it its “fire” or reflection of bright sparks of color. The classic round brilliant cut is the most popular style, but princess cuts, which accentuate a diamond’s fire, and baguette cuts, which accentuate luster and clarity but downplay the fire, are also commonly found in diamond rings. The cut of a diamond is not the same as its shape. The cut refers to the way the facets are cut into the diamond to reflect light, and the shape refers to the overall appearance of the diamond. Shape is largely a matter of personal taste. Common shapes include round, square, marquise, pear, oval, and heart. Of course, the quality of the diamond in your ring is important, especially if you are shopping for an engagement ring. However, you also need to consider other aspects of the ring when buying a diamond ring from JewelryRoom.com. Most diamond rings are made from 10 or 14k white gold, because the cool color of white gold doesn’t compete with the clear white brilliance of the diamond. However, you can also occasionally find yellow gold rings. Platinum bands and settings are also an option, albeit an expensive one. Be sure to carefully read the ring description and make sure you understand what the ring is made of. Then, you can estimate the worth of the metal in the ring and use that to help you price your bids. Don’t fall into the trap of assuming you can get any diamond ring resized. Rings that have multiple stones set across the top curve of the band cannot be sized up or down much at all, because the resizing would affect the settings. Anniversary bands that are completely encircled by stones can’t be resized at all. Diamond solitaires have the most flexibility for resizing. Because the rings at JewerlyRoom.com come from overstock sales and seized auctions, we have a mix of standard wholesale sized rings (size 7) and custom pre-sized rings. Be sure to always check the ring description for the size you need. If you have any questions about shopping for diamond rings on JewelryRoom.com or need help with the auction process, please contact us.